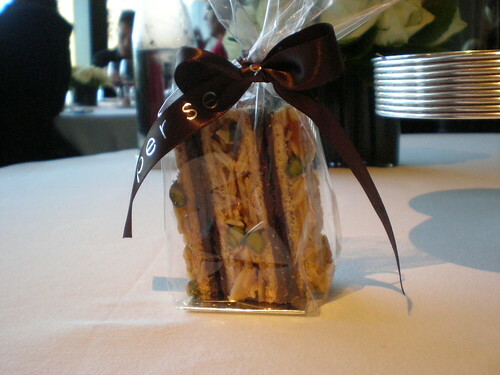 When I made reservations for lunch at Per Se, I made a note that it was a present for my sister’s birthday. When they called back to confirm the reservation they asked how to spell my sister’s name, and I started to realize just how special this meal would be. I had read Phoebe Damrosch’s Service Included, but I was not prepared for the actual experience. I had also read Bruni’s review, in which he declared that it was the vegetable tasting menu that had won him over, but I wasn’t prepared for the mastery of the cooking. Everything, from the food, to the service, to the interior design of the restaurant is so perfectly crafted that it basically creates an alternate reality that far outshines the “real world” just outside the restaurant’s doors. It seemed that every single server (and there were a lot of them) knew that it was my sister’s birthday, and periodically throughout the meal they would stop by to wish her a happy one. The service was truly flawless, with the army of servers working the tables like they were performing a ballet, moving effortlessly from table to table and performing whatever duty was needed. I really can’t say enough about the level of service — as my friend Jess said as I was trying to describe it, there is a real difference between a four star and a five star experience. And so, onto the food. The menu lists 10 courses, but we were started out with a couple amuse courses. First a pair of unassuming gougères (not pictured), which oozed warm gruyere cheese when we popped them into our mouths. We looked at each other in amazement. 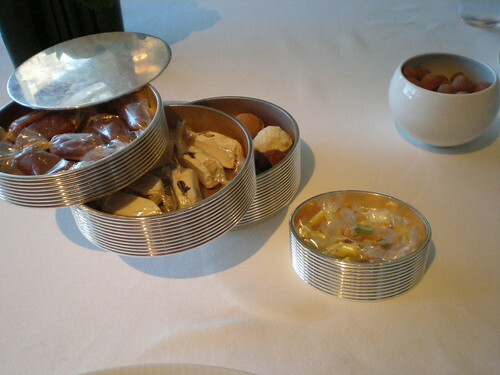 The gougères were the first sign that the food at Per Se was more than meets the eye. 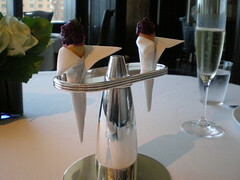 Next came a couple of tuile cones filled with a horseradish cream and topped with roasted beets. Deliciously sweet with a little bite or horseradish, the main statement here was that the kitchen was not afraid to be playful. It was a message that would be repeated throughout the meal and really contributed to the wonder of our experience. 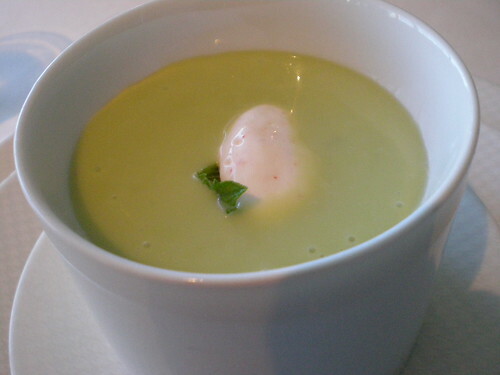 Then came the first on-menu item: chilled Hass avocado soup with honeydew melon and garden mint with espelette pepper-scented mousse. This was perhaps the least successful of all of the dishes we ate that day, though it was definitely interesting and we ate all of it. We were puzzling over it as we ate, trying to figure out what the flavor was. When he came to clear our plates, our server asked if we had liked it. “I don’t know,” I replied honestly. Then our server filled us in on the mystery taste — yogurt. As I said, it was an interesting taste, but I don’t know if it was good or not. 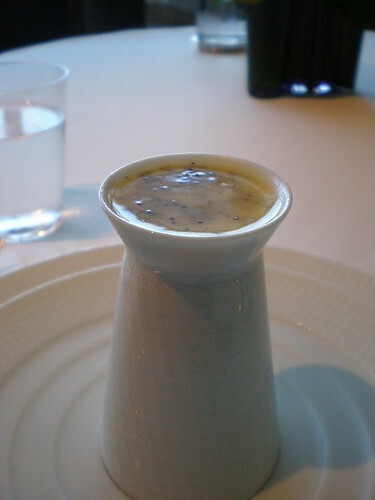 Next came an extra course, a fondue with gruyere and truffles. It was incredibly rich, and tasted strongly of butter. It was served in a perfectly small little dish. 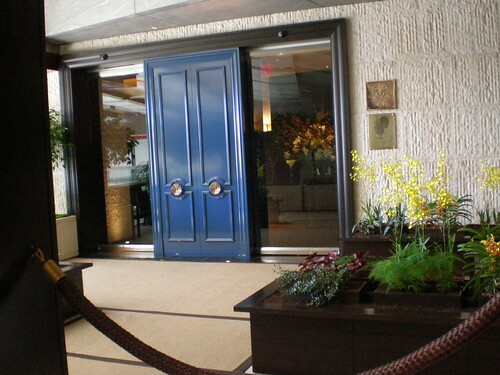 I know that one of Thomas Keller’s guiding principles is to give the customer just enough, to leave them wanting more. This was a perfect illustration of that; I could have eaten an entire bowl of this if they had put it in front of me, but that would have been overkill. 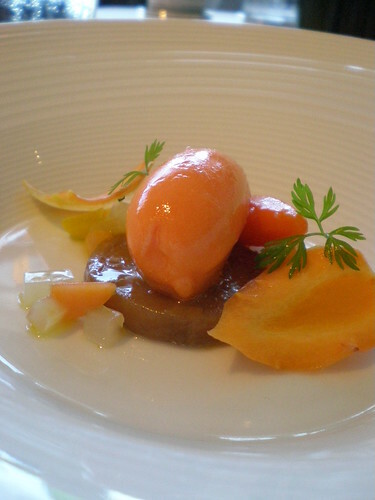 Then another menu item: sweet carrot sorbet with licorice-scented fennel bulb, greenmarket carrots and carrot fronds. The first bite was unusual. The second bite was a revelation. The flavor of carrot encapsulated in a sorbet. This ended up being my favorite dish of the meal. Eating it was like realizing the true possibilities of cooking — carrot sorbet, of course! The shavings of raw carrot alongside it seemed out of place because they were not treated in any special way, but I scarfed them down with the soft fennel and it was all good. Then came two kinds of butter, one salted and one unsalted. Our server told us the names of the farms where they had been produced, and then brought out a bread tray. We had our choice of a mini baguette, a mini focaccia, a pretzel roll, and a sourdough bun. We had the opportunity throughout the meal to sample each one. The best was the baguette, though all were good (our server said he preferred the sourdough roll). The pretzel roll was a little strange, because it tasted just like a pretzel. 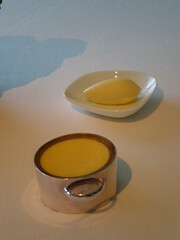 The unsalted butter was the better of the two, remarkably creamy and rich, but the salted butter was very good as well. So we were only two courses in and we had already eaten a ton of food. We really couldn’t imagine what was coming next, but we both had huge grins on our faces as we waited for whatever came. 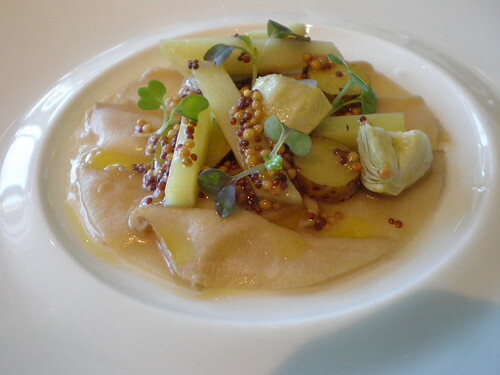 Salad of abalone mushroom, with new crop potatoes, violet artichokes and mustard seed “ravigote” is how the dish is described on the menu. It was while eating this amazing dish that I had two thoughts. First I looked down and realized that the combined cost of the ingredients on the plate couldn’t have been more than a couple of dollars. Almost simultaneously I thought “it doesn’t matter.” It didn’t matter because the ingredients had been treated so perfectly, so masterfully, that it was truly more than the sum of its parts. Sweet, slightly acidic, each ingredient perfectly fresh tasting that it was mind-blowing. At this point during the meal my sister declared this her favorite course. 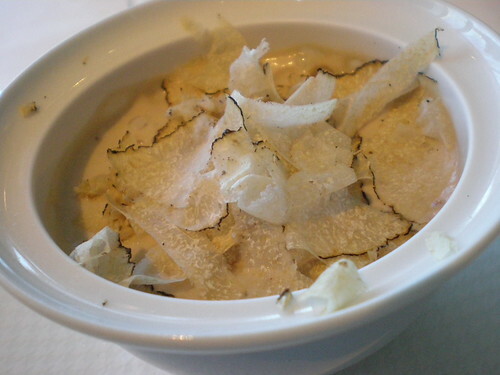 Next up was a dish with a very long name: coddled Quire Hill Farm’s ameraucana hen egg, shaved summer truffle and brioche melba with summer truffle “mousseline.” Our server brought out a lock box full of truffles and proceeded to shave a mountain of them over my sister’s dish. She did the same to mine, then decided she hadn’t given me enough, and shaved a bunch more on. Then we ticked in, and it quickly became my sister’s new favorite course. The egg was soft and creamy, soaking in a bath of thick truffle broth. This was the richest, most decadent course of the day, and it was delicious. 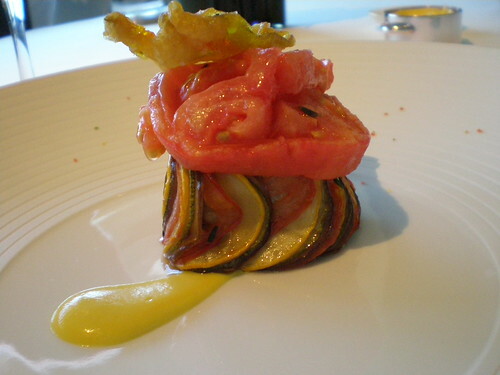 Thomas Keller served as a consultant on the movie “Ratatouille”, and here was the titular dish, in real life. My sister has a much better photo of it. As we were eating it, I realized that everything about this dish was perfect. Absolutely perfect. I don’t know what else to say about this. 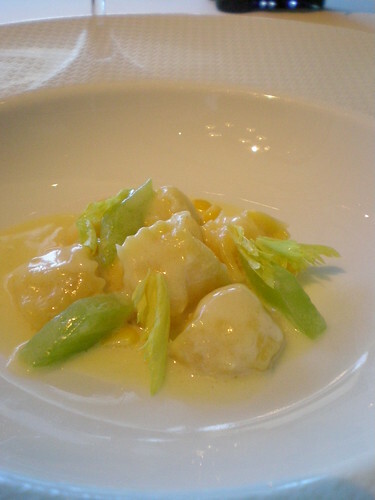 Next was the menu’s sixth course: sweet corn “agnolotti” with gold corn kernels and celery leaves with lovage cream. Not the best dish of the lunch; the cream sauce was overly salty to compensate for the sweet corn, and the portion was too big. Don’t get me wrong, it was very good, but not amazing. 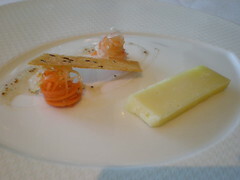 Next up was the cheese course, where we had a choice of two cheeses. My sister had a cheese called “Lord of the Hundreds” served with per se cole slaw and caraway seed crouton with caraway seed “aigre-doux.” I had Jasper Hill’s “bartlett blue,” with tellicherry pepper “sable,” compressed pluot and watercress with pluot “gastrique.” Mine was very good, sweet and salty and rich. My sister started talking while eating hers, and then something strange happened. She stopped talking mid-sentence, her eyes glazed over, and she slumped back in her seat. I started to laugh, because I recognized what had happened — her pleasure centers had overloaded. 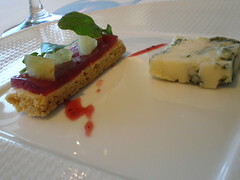 From the cheese course, remember. When she had recovered she insisted that I try a bite of hers, and I understood why she reacted the way she did. As I chewed the mix of cheese and coleslaw, something amazing began to happen in my mouth as the complexities of the flavors expanded. This was a remarkable combination of flavors. 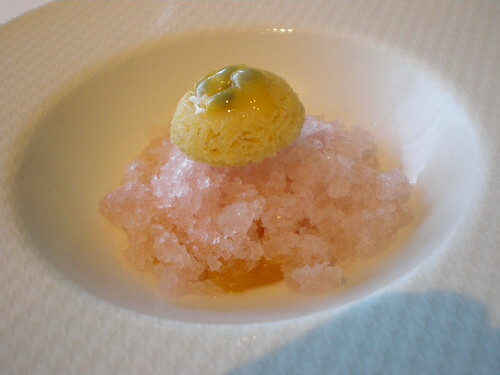 Then we received what our server called the “pre-dessert dessert” — pink Champagne granite with passion fruit pudding. This was another great dish, and a surprising one. It really seemed like like the two flavors should not have matched as well as they did; the sour champagne ice and the sweet, tart passion fruit were a great palate cleanser and a great mix of tastes, textures, and temperatures. 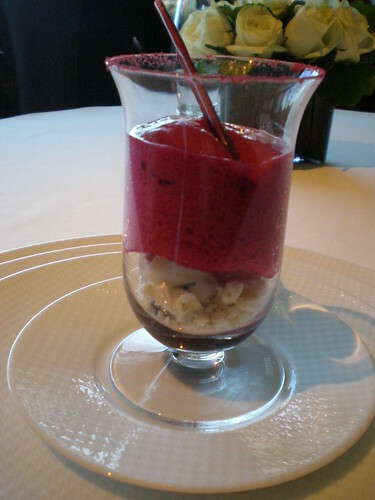 Then they brought out an extra dessert, described as blueberry fizz over popcorn sorbet over blueberry compote. I’m pretty sure that PopRocks were used in this dish, because the topping really did fizz in our mouths. This was the epitome of playfulness; in fact, just eating the dessert made us giggle like little kids. When is the last time that food made you laugh? It transported us back to childhood in an instant. Then came two desserts simultaneously. 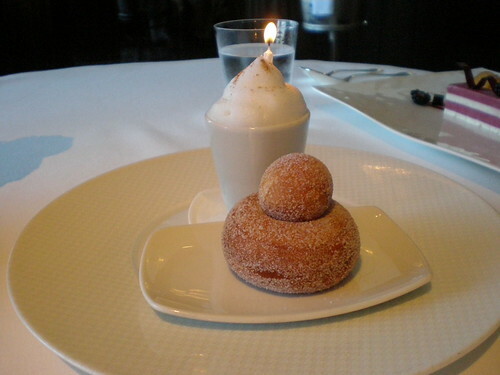 First, as a birthday present, one of Keller’s signature dishes — “coffee” and doughnuts, with a candle in it for my sister. The doughnuts were warm and perfect, but the coffee flavored semi-freddo in the cup was astonishingly wonderful. They also brought out the blackberry-anise parfait, with per se pancake, blackberry gelee, anise infused yogurt and BLiS maple syrup. 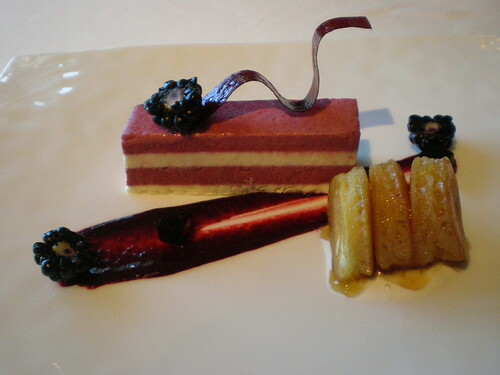 Sweet, tart, perfectly constructed and beautiful to look at, the warm pancakes were a great foil for the cold parfait. This is the last dish listed on the menu, and we were stuffed beyond belief. I put my napkin on the table in a sign of surrender, but our server stopped me. “You’re not done yet,” she warned. She was right. 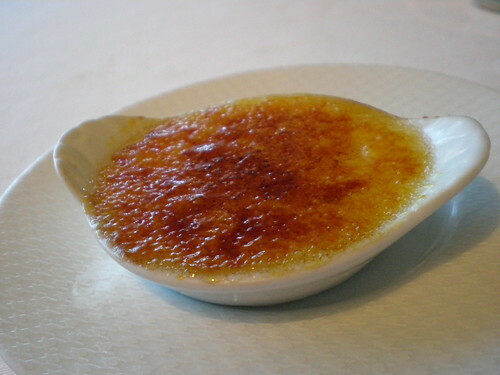 Next came a perfectly executed but unnecessary creme brulee. 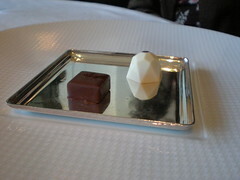 Then we had a selection of truffles to choose from. 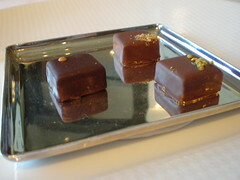 The two I remember were a brown butter truffle and a grapefruit truffle. Then came the post dessert snacks — caramels, nuts, mints, etc. And finally, a snack to take home with us. After three and a half hours we waddled out into the “real world” thoroughly stuffed, throughly awed, and thoroughly happy.